The Food Hall is a 18,000 square foot venue with about 24 different food stalls and 3 standalone restaurants. The food hall will feature a variety of food, dessert, and drink options. Urban eateries are becoming the new standard and the new social destinations. They provide a place where community, history, and culture come together in a socially entertaining way. Currently there is a higher desire to attract new food concepts and thus more flexibility, more local, more grass roots, thus more of a relationship. Gives access to up and coming chefs. Provide a platform for innovation and business incubation. Where will Union Hall be located? Union Hall will be located at the new Franklin Square development located between 7th and 8th Street on Franklin Ave. The food hall will span two buildings located closer to 8th Street. What are the hours of Union Hall? Union Hall will be open seven days a week for breakfast, lunch, and dinner. The specific hours for the Food Hall haven’t officially been finalized but we anticipate they will be Monday- Friday 7:00 AM – 10:00 and Saturday- Sunday 8:00 AM – 10:00 PM. Hours subject to change based on weekends, holidays and special events. Will a commissary kitchen be provided? Union Hall will provide a commissary kitchen with ample stainless steel prep tables, cold storage, dry storage and dishwashing stations. What will a typical food stall look like? Food stalls will range from 110 square feet to 600 square feet stalls. Each stall will be a blank canvas to allow tenant to build out to their suit. Tenants will be required to follow McLennan Health Department standards. 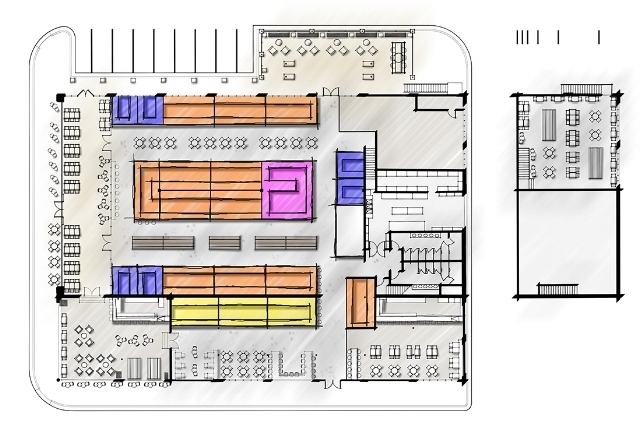 Union Hall will have a food stall design standard to keep some form of centralized look. Will I be able to serve alcohol from my food stall? One alcohol license including beer, wine & liquor will be held by 1 bar vendor for the whole space. Individual stall owners will NOT be allowed to sell or serve alcohol at their stalls with exception of the standalone locations. Standalone location with have their own designated address for TABC licensing. Your guests may wander the food hall and choose their own beverages from multiple locations in the Food Hall and you will be encouraged to sell non-alcoholic beverages that best represent your food and vibe. What will the lease terms look like? All leases are negotiable but basic leases will range from 2 to 5-year leases. How do I apply to become a vendor at Union Hall? For more information on the application process email jonathan@lucrarealestate.com .